Reclaimed wood + recycled glass = the ideal farmhouse-style serving set. 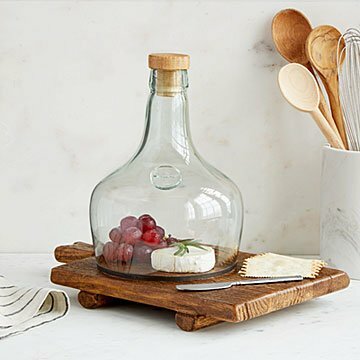 Reclaimed wood, recycled glass, and refreshing home decor all come together thanks to this farmhouse style serving set. While you're welcome to snap up the rustic wooden serving board or artisan crafted, mouth blown glass cloche separately, it's easy to see that these two are meant to be together. Aesthetically pleasing enough to leave out on the counter and functional enough to put to work at a dinner party, the set makes a smile-worthy gift for a host or hostess, which includes you, naturally! Bonus: Due to the nature of reclaimed wood and recycled glass, each board and cloche have their own unique imperfections (which we think is pretty perfect). Handmade by Stacy Borocz in Hungary. Wipe glass cloche and wooden base with a damp cloth to clean. When dry, help condition and preserve your wooden base with mineral oil.